Barging Is Not River Cruising! Amadante sailing near Passau, Germany. Photo courtesy of AmaWaterways. Make no mistake. River cruises and barge cruises are completely different beasts. Designed specifically to transit locks along the way, modern river cruisers are long and narrow, as are the locks themselves, which measure more than 600 feet long but are only about 40 feet wide. Barges typically are smaller and with fewer frills and amenities than river cruisers. Whereas river cruisers may carry more than 100 passengers, barges range from a few passengers to a couple dozen. Designed specifically to transit the canal’s locks, modern river cruisers are long and narrow, as are the locks themselves, which may be 600 feet long but are only about 40 feet wide. These dimensions, particularly the width of the locks, continue to pose challenges for designers of river vessels. Though some river cruisers feature balcony staterooms, many retain the real estate that would be allocated for balconies to create more expansive interior space. Some river cruisers do have balcony staterooms, where you can sit and watch the landscape pass, but take solace if your stateroom does not have a balcony: Nearly all vessels have a broad expanse of sundeck only a deck or two up. Most staterooms aboard Amacello feature French balconies. Photo courtesy of AmaWaterways. 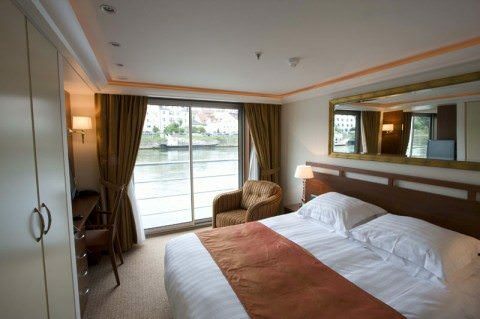 The typical river cruiser has four decks, including an upper sundeck, with two to three decks below it containing a series of staterooms on each side of the ship. Staterooms typically have a queen-size bed that can be reconfigured to two single beds, a TV, storage space, and a small, though often well-appointed and modern bathroom with shower and usually no tub. Contrary to an odd, yet persistent rumor, toilet paper may be flushed, as opposed to depositing paper in a bin for collection later. 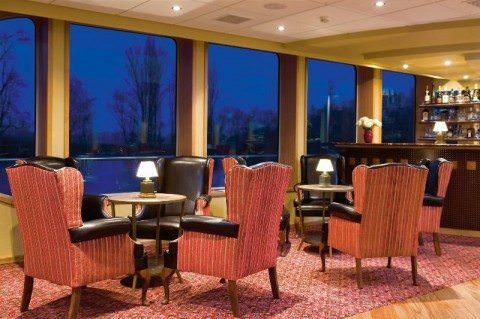 The lounge aboard River Princess features panoramic views. 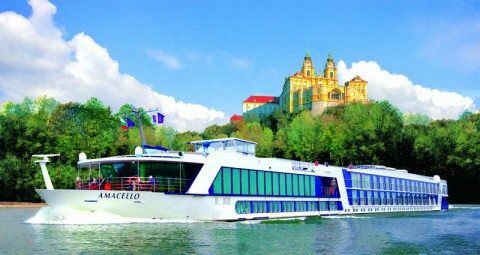 Photo courtesy of Uniworld River Cruises. Public rooms typically include a restaurant, lounge, spa, and fitness center. While other features vary, some cruisers offer Wi-Fi service, bicycles for use on shore, a whirlpool tub and sauna. At least two river cruisers in operation today have swimming pools. 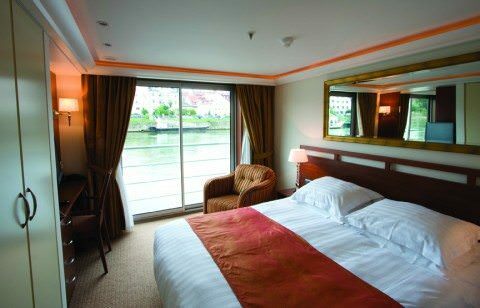 River cruisers are essentially barges with an integrated hotel above and typically carry 100 or more passengers. Some river cruiser are à la carte, but some are nearly all-inclusive, meaning that wine and beer are served at lunch and dinner, and that some form of shore excursions, such as guided city walks, are included for each port. 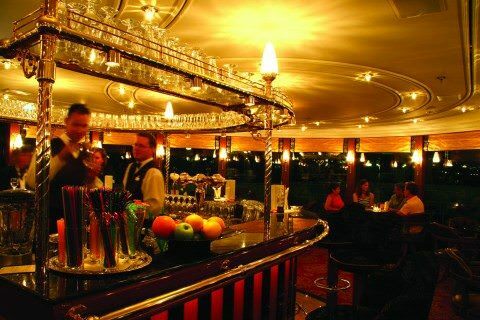 The elegant Main Lounge aboard Swiss Emerald comes alive at night. Photo courtesy of Tauck. Cruises are competitively priced, and you should expect to pay from $200 per person per day to $500 per person per day depending on the ship, itinerary and level of accommodations. Barges typically are smaller and have fewer frills and amenities than river cruisers. Whereas river cruisers may carry more than 100 passengers, barges range from a few passengers to a couple dozen. 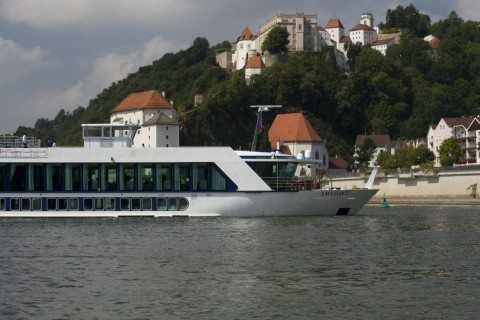 One of the big differences between a river cruise and a barge cruise is the amount of territory you’re able to cover. Barge cruises usually span six days and travel fewer than 50 miles of river in a week, while river cruisers may travel few hundred miles. Transiting the locks can be time-consuming, and passengers sometimes prefer to walk or bicycle along the canal’s banks (often outpacing the barge). Activities such as hot-air ballooning, horseback riding, guided tours, tennis, and golf are offered by most barges, usually for additional costs. 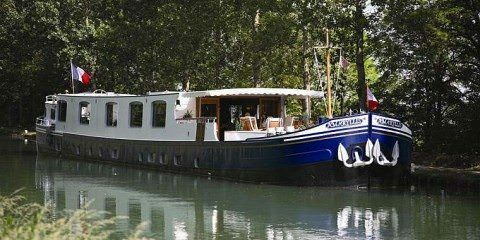 A barge normally cruises within one region of one country (usually France) while a river cruiser can travel through several countries and on several rivers during the span of one sailing. Barges typically have only one deck, smaller staterooms, and a combination dining room and lounge. Barge staterooms almost always have private facilities. Barges are typically smaller and carry less passengers than their larger river counterparts. Barges are usually all-inclusive, including drinks, fine wine and champagne; gourmet cuisine (using fresh, local ingredients and cooked to order); pickup and drop-off from local airports, train stations and hotels; shore excursions and all entrance fees included in the cruise fare. Bicycles are often available for use on shore. Some barges even have a whirlpool tub, pool and exercise equipment. 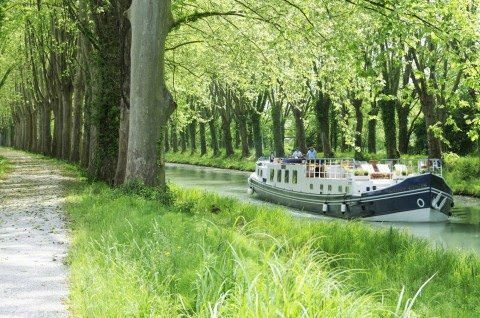 Although barge cruises are offered in Belgium, Germany and Holland, France is the most popular destination. While you may think of a river ship as a floating hotel, a barge is more reminiscent of a country manor house. Though most barges are staffed, there are self-drive barges. Small groups, such as family or friends, may book the entire barge, or barges may be booked by individuals, preferably liked-minded people who don’t mind sharing space in a small setting. Barge cruises are more expensive than river cruises and can range from $350 per person per day to more than $1,000 per person per day. These are often for six days, because one day is reserved to prepare the barge for the next group of people. Whole barges can be chartered from $15,000 to more than $60,000.